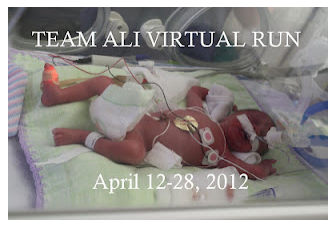 Suz & Allan over at Cows and Lasers and Everything In Between are currently hosting a virtual run for their niece, friend Jenn, and Suz's mom - all who came into this world as premature babies. Head on over to their blog to read these amazing stories. You will tear up for sure. Their stories hit home for me as well. A very dear friend's baby girl came also came into this world as a premature baby. Reading these stories brought me back to the day I met A in the hospital. She was so tiny and incredibly fragile. My heart ached for her and her family. She is now a very strong willed 3 year old girl who is indeed a fighter. I am thankful for having her in our life. Last night Pepper and I went out for another run and I decided that I was going to dedicate that one to Team A.L.I. and our A. 5 miles w/ Pepper - done! Here's hoping Team A.L.I. raised quite a bit of money for the March of Dimes. Thank you for putting together this virtual race, Suz and Allan. I hope your fundraising efforts were successful! This is such a sweet post Jen! Thank you for participating and Sasha and Lucky say thank you to Pepper too! Boy, those pictures bring back some not so distant memories! I wonder what strong willed girl you are referring to...hmmmm? This looks like an amazing virtual run. I will check it out later and see what I can do to help. This is an important cause! Yes - you should!!! Go now. You know all too well. Love ya! Thanks for sharing this! And nice job on the run. I need to remember to run mine tomorrow! Great post Jen! I love that you ran this race and that it had a special place in your heart and life too.